Lotus can reach only 125 cm (50 inches) in height but it spreads 3 meters (10 feet) horizontally (width). Lotus uses rhizomes to attach itself to the ground. Rhizome is buried in the mud or in the sandy floor. Lotus flowers are found in white, pink, red, blue, purpule and yellow colors and they grow in shallow and murky waters. Leaves of lotus are shaped like paddles. They can reach 20 inches in length. Some of the leaves are submerged, while others float on the surface of water. Leaves are equipped with air pockets (inside the tissues) which maintain buoyancy. In Egyptian mythology, the lotus is associated with the sun, as it flowers at the day hours, and closes by night. Lotus is even believed to have given birth to the sun. Lotus produces seed in the circular pod located in the center of the flower. The lotus is a sacred flower for Buddhists. For Buddhists, the lotus flower represents purity of body, mind, and spirit.The Lotus is one of the eight auspicious signs of Buddhism – an eight petalled lotus used in Buddhist mandalas symbolizes cosmic harmony, a thousand petalled Lotus, spiritual illumination. Seed can remain viable (able to germinate) long period of time. One type of lotus seed managed to develop into plant after 1300 years of dormancy. Flower opens in the morning and closes at night. Lotus was a symbol of sun, rebirth and creation in the ancient Egypt because of this unusual behavior which marks the beginning and the end of the day. Dried pod of lotus flower is very decorative and often used in floral arrangements. Petals are also used in ornamental purposes. Flower can reach 8 inches in diameter. Lotus is either pink or white in color. Petals are shaped like a dagger. They are arranged in several layers. Lotus flower protrudes several inches above the water. This flower is known by its beautiful odor. Flower, young leaves, seeds and root are edible and often used in Asian cuisine. Older and bigger leaves are used for wrapping of food. Lotus is rich in fibers and vitamins of the B group. It is also rich source of iron and other important minerals. According to Hinduism, within each human is the spirit of the sacred lotus. It represents eternity, divinity, purity, and is widely used as a symbol of life, fertility, ever-renewing youth. Dried stamens of the lotus are used for the preparation of aromatic tea. Unlike other flowering plants, lotus is able to maintain stable temperature of the flower. Scientists believe that warmth of the flowers attracts cold blooded insects. 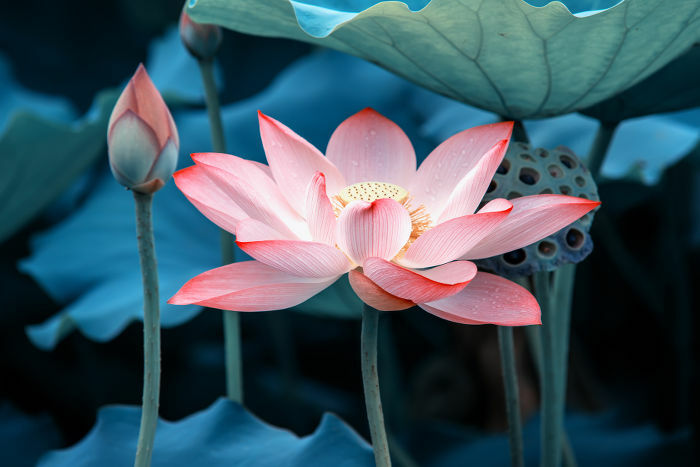 One of the most common metaphysical analogies compares the lotus’ perennial rise to faultless beauty from a miry environment to the evolution of consciousness, from instinctive impulses to spiritual liberation. Lotus and water lily look similar but they belong to different genera. They differ in the color of the flower and type of the seed pod. The pink lotus is the national flower of India and Vietnam. Lotus is worshiped and considered as sacred flower in Buddhism. Depending on the number of petals, it symbolizes either cosmic harmony (eight petals) or spiritual illumination (thousand petals). Buddhists turn lotus into powder and use it in different ceremonies. Various parts of the sacred Lotus are also used in traditional Asian herbal medicine. Lotus can survive thousands of year and even to revive after long period of dormancy. Flower, young leaves, seeds and root are edible and often used in Asian cuisine. The lotus flower is a very popular tattoo. Korea, China and Japan all have Lotus Festivals, celebrating the beauty of this flower.